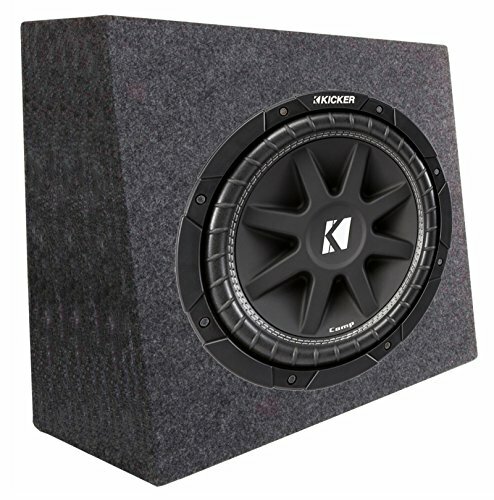 The KICKER 43C124 12" 300W 4-Ohm COMP Car Audio Subwoofer is the best balance between high value and high performance available in today's round-subwoofer market. It features the stiffest injection-molded cone with flex-killing, 36-degree back bracing, updated coil-cooling perimeter venting, high-temp voice-coil wire, Spiralead tinsel-lead technology for ultimate durability, nickel-plated push terminals, resilient steel basket, yellow double-stitched surround, and is versatile enough to perform in vented or sealed enclosures, as well as, free-air applications. This Q Power TW12-Single Single 12" Sealed Car Audio Subwoofer Box Enclosures feature solid 5/8" MDF construction, charcoal carpet covering, terminal cup connectors, 0.9 cubic feet of air space per Box, and a mounting depth of 5.5 inches. Turn your ride into a sound machine with the help of the QPOWER QTW12 Single 12" Sealed Car Audio Subwoofer Sub Box Enclosures!